Vaccines have been identified as one of the greatest medical accomplishments in the history of disease prevention. While the invention of immunization dates back to 1798, with the introduction of Edward Jenner’s smallpox vaccine, it was not until after World War II that most of the currently utilized vaccines were introduced to the general public. 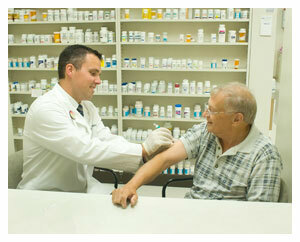 Today the Pharmacists at Thompson Pharmacy provide you with immunizations of various types. Flu immunizations and Zostivaz (Shingles) are available daily for same day appointments. Call for more information on all other vaccinations. For your immunization schedule your appointment today. It’s easy! Simply call the Chestnut Ave, Juniata or Blair Street Hollidaysburg Pharmacy. Or, better yet, fill out and submit the form to the right to request an appointment! Click here for a complete listing of Thompson Pharmacy phone numbers. Onsite Flu Clinics: Bringing the Clinic to YOU! The CDC recommends everyone over 6 months of age receive a flu shot. Let Thompson Pharmacy bring the clinic to your group environment. At Thompson Pharmacy, we understand that it can be inconvenient to actively seek out getting the shots you and those in your group environment need, especially flu shots which are needed every year. Thompson Pharmacy makes it easy for you and your group environment to get vaccinated by bringing the vaccines and our immunization providers to you! Call 877-944-6131 or click here to email us to get the process started!